NEW for 2017! 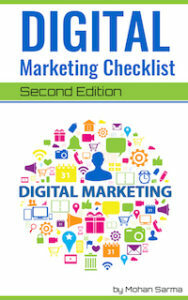 A Top 10 digital marketing checklist for anyone. Whether you are a student, building a startup, first digital marketing job, or experienced marketing practitioner, this checklist is here to help. Includes a list of my favorite digital marketing links. What is my #1 for digital marketing? Hint: you’ll need to be really honest with yourself. And it needs to work… Every time. What is my #2 for digital marketing? Hint: type this in the search bar. Score if you own it! What is my #3 for digital marketing? Hint: success means it loads fast with no errors on any device. What is my #4 for digital marketing? Hint: schmoozing matters online too. What is my #5 for digital marketing? What is my #6 for digital marketing? Hint: Shakespeare and Vincent H. O’Neil are really good at this. What is my #7 for digital marketing? Hint: old school tools still work. They work really well! What is my #8 for digital marketing? Hint: providing this can boost your feedback ratings. What is my #9 for digital marketing? Hint: experts live all over the world. Get the resources you need to win. What is my #10 for digital marketing? Hint: the perpetual motion machine keeps on delivering.